Crystal Sonic Rejuvenation is a holistic, painless, and rejuvenating facial treatment that helps the face and whole body look and feel younger using the energy of crystals and sound therapy. Sessions include a Bio-Mat treatment. Six treatments are recommended for the best initial results with a simple maintenance plan to follow. Join the Frequent Facials Club: For every 5 facials you purchase, get the next one FREE. 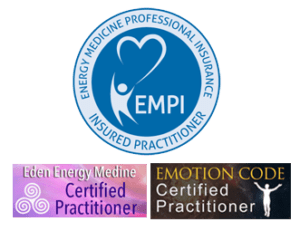 Initial Energy Medicine sessions are 1.5 hours and include a variety of tests and corrections to ensure that your energy is flowing properly through your body. Follow up sessions can take anywhere from 1 hour to 1.5 hours. Whether you’re struggling with a particular health concern or just want to keep your body in tip-top shape, your body’s energies will dictate the course of treatments to ensure you get exactly what you need. $450 – Pre-paid package of 5 sessions –Purchase 5 sessions and save $50. Identify and release trapped emotions that can cause pain, malfunction of bodily tissues, disease, depression, anxiety, and emotional problems. A relaxing Reiki session will relieve you from fatigue, insomnia, and stress and give you a more positive outlook on life, while experiencing an increase in energy. Crystal Reiki is the same as a Reiki session only crystals are placed over your chakras and you will receive one crystal to take home. That crystal will be chosen based on your body’s needs. This protocol can stand alone or be a preliminary to other energy techniques. It opens up your energies and activates better flow throughout the body by clearing clogged energy and balancing the basic energy systems in the body. A wonderful protocol for stress, overwhelm and releasing your body from “fight or flight” mode. After a relaxing Quickie Balancing Treatment, specific points on the head are held lightly in sequence to calm the system & return it to a place of peace, safety, and comfort. It can enhance the health of the blood flow help to expand and weave the auric field. This can be very soothing for anyone suffering from aches & pains. It helps with stress reduction, insomnia, calming the nervous system, stabilizing emotional imbalances, deep relaxation, and restless leg syndrome. It can counteract nausea and can help to mitigate the side effects of chemotherapy & radiation treatment. Sessions begin with a Quickie Energy Balancer treatment then your toes are held lightly in a specific sequence which brings on a sense of profound relaxation & wellness. A Chakra clearing session begins with a quick Spinal Flush that releases toxins from your body. Each chakra is then cleared, energized, and connected. This sacred work can bring on profound relaxation & the sense of being lighter, yet more grounded. Individual chakras are energy tested before and after treatment along with a Bio-well report to visually show your chakra energy level and alignment. Are you plagued by food sensitivities? Do you wonder if your food choices and/or supplements are actually helping you? Do you get side effects from prescribed medications? Energy testing can determine which foods or supplements are impacting you in beneficial and non-beneficial ways. Relieve chronic pain and stiffness, speed the healing of joints and tissue, improve circulation, detoxify and boost your immune system while laying on the deeply relaxing BioMat.